You are currently browsing the category archive for the ‘Thursday Tea’ category. 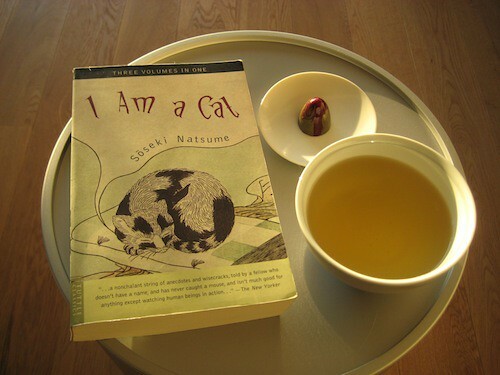 I’m still reading part 3 of I Am a Cat by Natsume Sōseki, a Japanese classic from 1907. I’m drinking some Chung Hao Jasmine in original Japanese tea cups made from Arita porcelain. This Chinese tea is also a classic. With my book and tea I’m relishing the #1 award winning Dutch bonbon of 2009: ‘bullet’, by Visser Chocolates. It’s a luxurious cherry flavour, with a soft mochi-like filling at bottom. The protagonist of my book is (obviously) a cat and I don’t see it drinking tea, but its master Sneaze could definitely be enjoying this classic beverage during the many languishing hours in his study or on the veranda. In the early 1900’s Chinese tea had been an imported product in Japan for many centuries. The cat is a sweet tooth and likes mochi… so the candy is perfect too! And look at those gorgeous colours: all gold, green and burgundy red in the glow of a soft winter sun! Thursday Tea is a fun meme for tea loving readers, hosted by Birdbrain(ed) Book Blog. What tea are you drinking (and do you like it)? What book are you reading (and do you like it)? 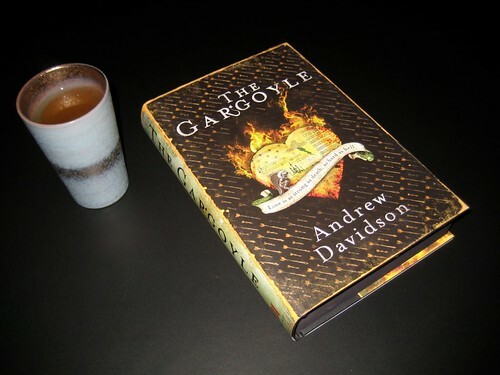 Tell us a little about your tea and your book, and whether or not the two go together. I’m drinking organic green tea with ginger and lemon. Spicy! Because it’s cold outside: it has been snowing for the first time this winter :) It’s a Dutch brand, Piramide, using Vietnamese green tea from around Suoi Bu village. It is perfect for days like this.